Born in 1954 in Lublin, Poland, he lives and works in Warsaw. In 1979 he graduated with a diploma from the studio of Professor Stefan Gierowski at the Faculty of Painting of the Academy of Fine Arts in Warsaw. He has been active in the fields of performance art, installations, objects and drawing. A member of the creative group Pracownia in 1976–81. In 1977–79, Bałdyga was one of the organizers of Pracownia Dziekanka, a venue of numerous artistic and workshop activities. A member of the Akademia Ruchu theatre since 1979. Since 1982 he has been developing his own educational programme in the form of workshops and lectures held at galleries and art and theatre centres. Since 2009 he has run the Performance Art Studio at the Faculty of Sculpture and Spatial Activities of the University of Arts in Poznań. 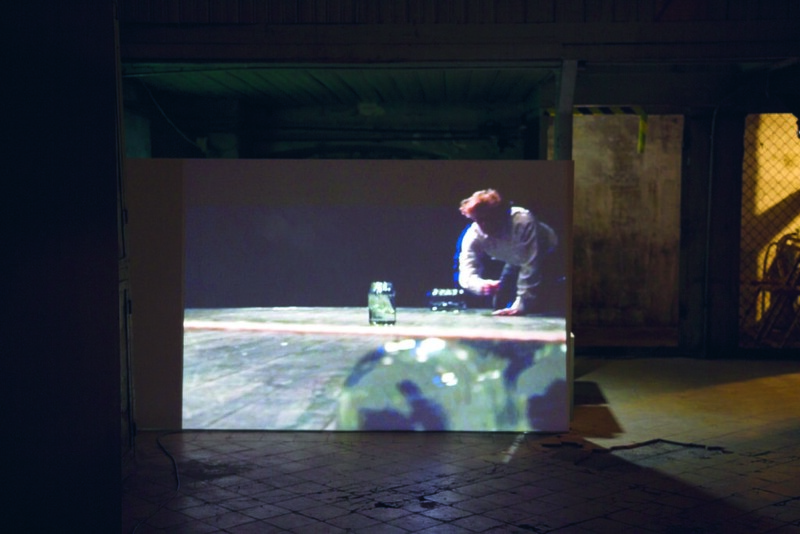 A participant in a wide range of art manifestations in Poland and abroad, such as Process and Construction, Munich (1985); Eastern Points, Glasgow (1990); Around the Sculpture of the 1980s and 1990s, Orońsko (1995); Generations – Polish Art of the End / Beginning of the Century, Saint Petersburg (1999); RIAP, Quebec City (2004), Art Week, Lviv (2009), NIPAF, Tokyo, Osaka, Nagano (2013), Future of Imagination 9, Singapore (2014), Venice International Performance Art Week, Venice (2016). His works have been presented at numerous individual exhibitions and presentations at Moltkerei Werkstatt, Cologne (1985); Wschodnia Gallery, Łódź (1996); Awangarda Gallery, Wrocław (2001); Centre for Contemporary Art Ujazdowski Castle, Warsaw (2008); Efremowa 26 Gallery, Lviv (2013); Entropia Gallery, Wrocław (2016), Propaganda Gallery, Warsaw (2017), amongst other venues. Bałdyga’s works can be found in the collections of the Centre of Polish Sculpture, Orońsko; Centre for Contemporary Art Ujazdowski Castle, Warsaw; Museum of the Academy of Fine Arts, Warsaw; “Signs of Time” Collection, Lublin; Museum of Contemporary Art, Hunfeld; Muzeum Sztuki, Łódź; Exchange Gallery, Łódź, as well as at other places. Janusz Bałdyga is one of Poland’s foremost performance artists, connected with the circles of “Dziekanka” Gallery and Akademia Ruchu collective. His work Attention: Border renders the tile for the whole exhibition. In his parsimonious performances he often focuses on the idea of a border or a boundary. In Border Crossing he used a dramatic story of the village Tokary in Podlasie, Eastern Poland, which after the war in 1945 fell victim to the new border division between Poland and the Soviet Union. It turned out that the arbitrarily drawn border went through the village, dividing it in half, but also cutting separate allotments or even households in half. Often the way to save one’s household was to bribe the geographers or soldiers with alcohol. The village remains divided until today, just as it was in 1945. In this simple, but strong action, Bałdyga marks a border by holding a rope across the stage and pushing half-full jars with water into it. Some will bounce back, some will fall and the water will spill. The water mark, which remains after the artist removes the rope, is like a sign of sacrifice or a blood stain. The artist suggests that marking new borders always comes at a price, somebody becomes a victim, there are always winners and losers. Bałdyga, one of Poland’s foremost performance artists, has been interested in the subject of borders for years. Not only a physical, political border, but also an internal border which delineates our personal space. During the exhibition the artist will make a performance, the physical remnant of which will be put between the two huge photographs, depicting the artist covering his face with his hand. One photo is from his youth, the other one from the present day. The artist quotes Hastings Donnan, saying that “borders are where wars start”. 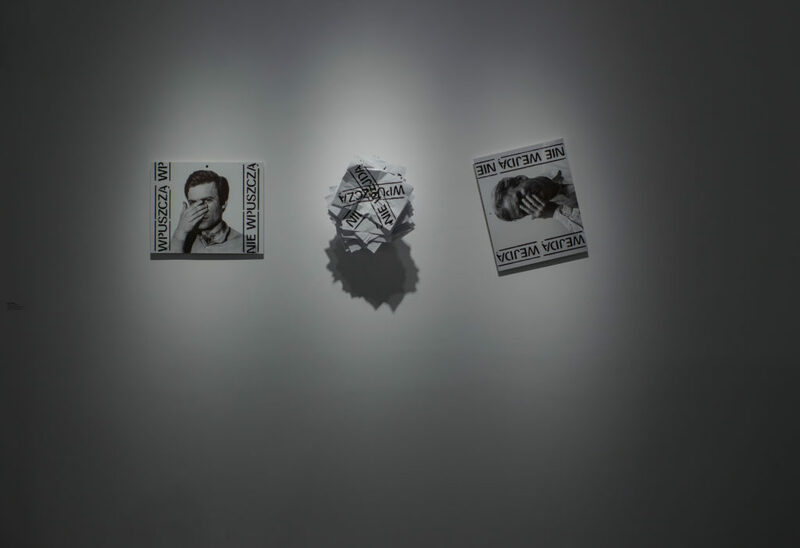 The current work refers to his old performances from the 1980s, Using force and Attention, Border, which, as it may be presumed, were immersed in the reality of the late People’s Republic of Poland. This time the artist’s face photos relate to passport control at a border crossing. Yet, they are „spoiled” with his hand covering the face. Will he enter or not? This work expresses his refusal to subordinate our image and personal freedom to control. The reference to his old work makes us look again and critically at the current reality of Poland and Eastern Europe, where some control methods are replaced with others and some elements of restricting freedom remain forever the same.